LOS ANGELES (AP) — A Los Angeles teachers union leader hinted of a possible resumption of contract bargaining Wednesday as striking educators in the second largest U.S. school district walked picket lines outside hundreds of schools for a third day. “We’ll have more information for you later in the day about the bargaining table and when we’re getting back to that bargaining table,” United Teachers Los Angeles President Alex Caputo-Pearl told teachers rallying in the rain outside a high school. Caputo-Pearl said the union had “engaged” Mayor Eric Garcetti to help in the dispute that prompted administrators to staff classroom with substitute teachers, but he provided no further details. The mayor does not have authority over the school district but has been involved in seeking a resolution of the contract dispute. Los Angeles Unified School District administrators have urged the union to resume bargaining. “We need our educators back in our classrooms helping inspire our students,” Superintendent Austin Beutner said Tuesday. Teachers are pressing for higher pay, smaller class sizes and more support staff that school officials say could bankrupt the nation’s second-largest system. Teachers with the independent Accelerated Schools charter network — who are also union members but negotiate their contract separately — walked off the job Tuesday to demand better working conditions and in support for public school educators. Beutner has said he envisions moving toward a system with public and charter schools under the same leadership. Critics contend Beutner, an investment banker with no education background, wants to run schools like a business. 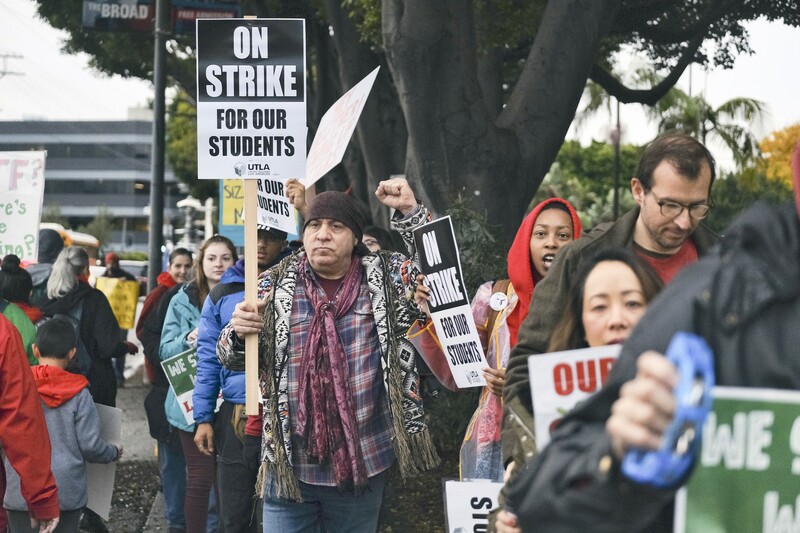 Charter teachers joining the strike is a big deal because it shows they “see themselves in solidarity with the broader body of district educators,” said John Rogers, a professor of education at University of California, Los Angeles. It wasn’t clear how many charter teachers walked off the job. Unlike strikes in other states, all 1,240 K-12 schools in LA Unified were open. The district has hired hundreds of substitutes to replace tens of thousands of staff, a move the union has called irresponsible. The walkout Monday was marked by a plunge in attendance, with about 144,000 students out of more than 600,000 in class. On Tuesday that number grew to 159,000. Parents who sent their kids to school wondered how much teaching was happening as students were herded into large groups. David Biener said his son and daughter completed worksheets in math and history while sitting on the gym floor at their middle school. Biener was undecided about whether the kids would go back to school on Wednesday. No new talks have been scheduled. The union rejected the district’s latest offer to hire nearly 1,200 teachers, counselors, nurses and librarians and reduce class sizes by two students. It also included a previously proposed 6-percent raise over the first two years of a three-year contract. The union wants a 6.5 percent hike at the start of a two-year contract. Caputo-Pearl, the union president, said members are “prepared to go as long as it takes” to get a fair contract. The last strike in 1989 lasted nine days. Meanwhile, Beutner urged the teachers to join him in pushing for more funding from the state, which provides 90 percent of the district’s money. The district says the demands run up against an expected half-billion-dollar deficit this budget year and billions that are obligated for pension payments and health coverage for retired teachers. “The painful truth is we just don’t have enough money,” Beutner said. The union argues that the district is hoarding reserves of $1.8 billion. Teachers earn between $44,000 and $86,000 annually depending on their education and experience. The district says the average salary is $75,000.